SPX above that solid strong support zone 2690/2700 is still bullish but a close below 2690 is bearish. 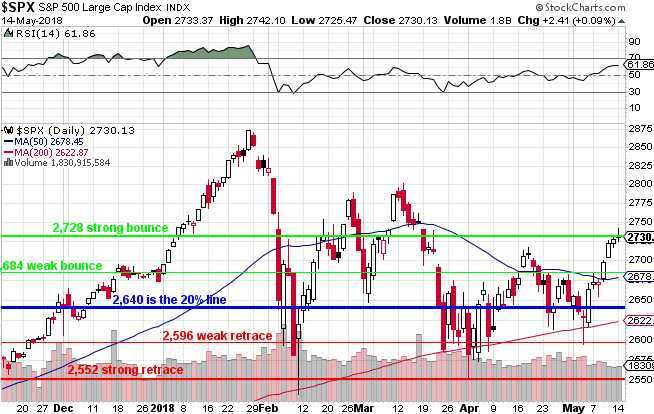 That 2690/2700 zone has been well-traversed and tested so expect the markets to find great difficulty in closing on a daily basis below that, at least for now. However a pull-back can quickly morph into a reversal, taking out critical support and closing below important averages and Fib levels. I still think this is a pullback that may stop at the 2700 level but am prepared for a move much lower. Closed VXX long, a decent profit. "...the index is pulling back as the Dollar rises back to the top of it's range. Eventually, one of these will break out and the other will fall – but which one will prevail?...." It looks that the adage "Sell in May and Go away" may turn out to be true for this particular year.